Don't operate your backup or alternative electric power system blind, risking damage to your generator and/or appliances! Install this meter so you can see everything that is happening. Perfect for monitoring generator parameters when your transfer switch or panel does not have meters. 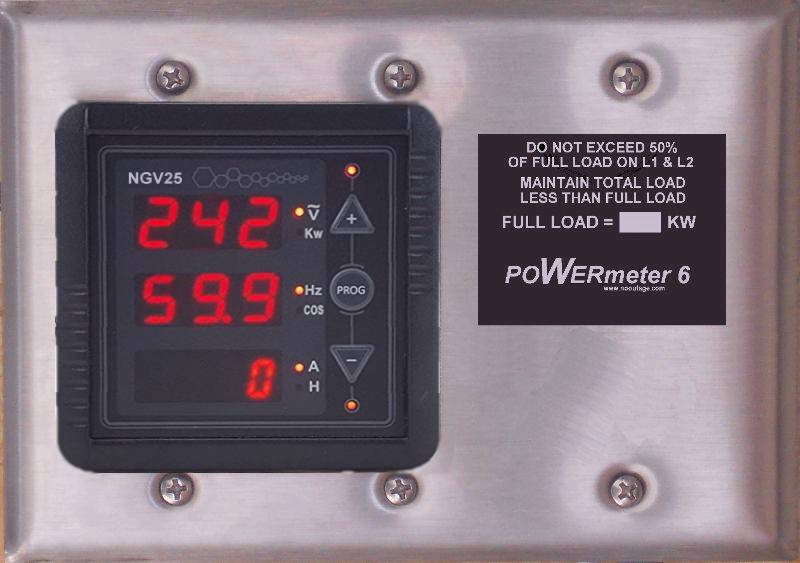 The kW display will show if you are overloading the generator and the Voltage and frequency (Hz) displays can be used to verify the generator is operating properly. An optional selector switch is available so that you can directly read the load on each hot leg of a standard split-phase North American power system. For regions that do not use a split-phase system such as most of Latin America and Europe the switch is not needed. 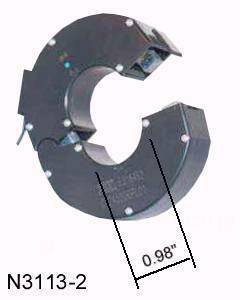 This meter works on 60 Hz North American power systems and 50Hz systems in other regions. 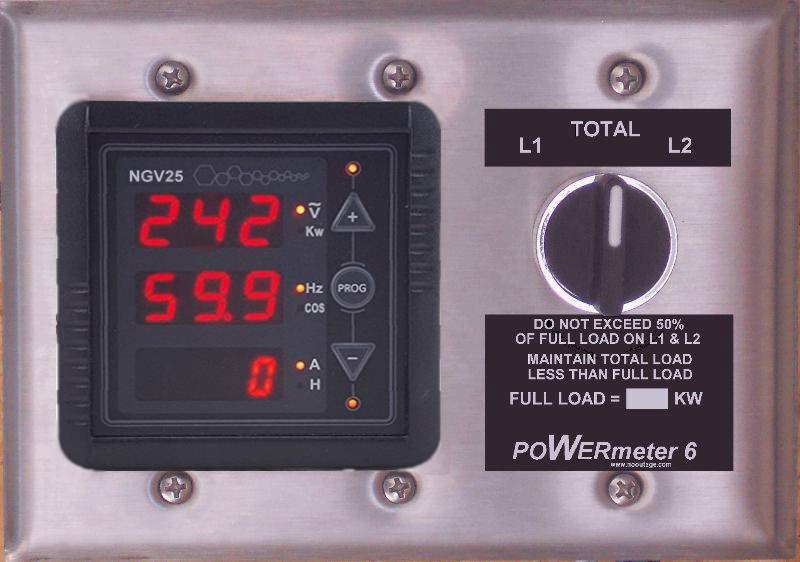 Unlike analog meters that can only be accurately read over a limited fixed range this digital power meter can display both small values of generator output AND large values of utility input. Therefore this one meter can be used to monitor your normal utility power usage and your standby generator usage. And only a single set of current sensors is required. See the right-most connection diagram above. This new line of instruments is designed as a cost effective alternative to the traditional separate analog panel meters and can replace up to six meters. 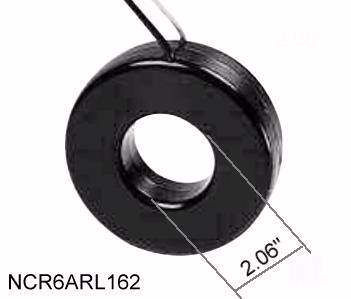 An electronic solid-state design ensures maximum durability against vibration while a microprocessor based digital sampling technology provides maximum accuracy and stability in a wide range of environments. The normal display shows Voltage, Hertz and Amps and a second page shows the other three parameters. Meter comes pre-programmed to match included sensors. 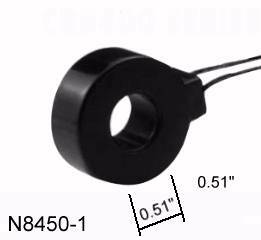 Standard current transformer sensors are provided as shown. Special models or mountings are also available upon request. Use when measuring load on two individual wires is not needed, OR for power systems that are NOT split-phase such as in the following countries: Argentina, Australia, Austria, Belgium, Brazil, Chile, Denmark, Finland, Germany, Greece, Grenada, Guadeloupe, Haiti, Hong Kong, Iceland, Ireland, Israel, Italy, Jordan, Kenya, Kuwait, Luxembourg, Malaysia, Mexico, Montserrat, Netherlands, New Zealand, Norway, Paraguay, Peru, Poland, Portugal, Qatar, St. Kitts & Nevis, St. Lucia, St. Vincent, Sweden, Switzerland, Turkey, U.K., Uruguay. Use when measuring of load on two individual wires of split phase system such as in the following countries: Bahamas, Belize, Bermuda, Bolivia, Canada, Cayman Islands, Columbia, El Salvador, Guam, Guatemala, Jamaica, Japan, Nicaragua, Panama, Philippines, Puerto Rico, Trinidad & Tobago, USA. 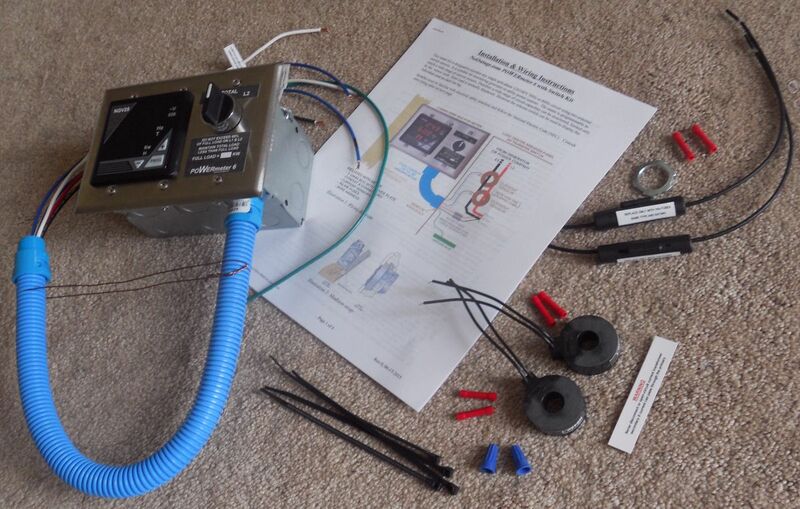 Split core sensors can be installed without disconnecting power cables. 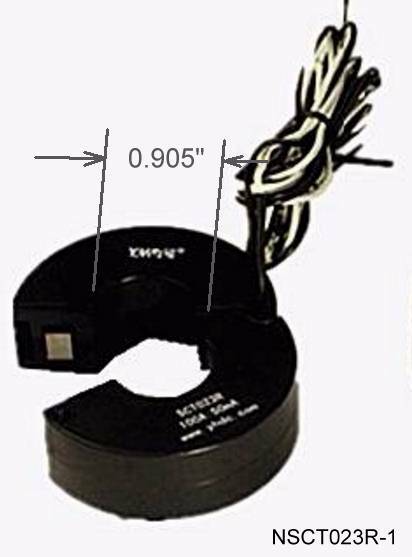 These are particularly useful if you want to monitor an existing electric service without having to disconnect the main power cables to install the sensors. When monitoring generator AND utility, if both cables will not fit through one current sensor opening, select and order two sets of current sensors. For applications in other countries not listed above contact us if you need assistance selecting the proper meter.